This elegant hacienda sparkles from dawn to night. From the entrance courtyard to the glistening pool and white sandy beach Casa Buena Suerte is bathed in exquisite reflections. Casa Buena Suerte is located on Soliman Bay a short distance south of Akumal, a picturesque beach situated along the second largest coral reef in the world. The Caribbean breaks just outside the bay, replete with natural beauty, sea life and the splendor of the reef. This elegant hacienda sparkles from dawn to night. From the entrance courtyard to the glistening pool and white sandy beach Casa Buena Suerte is bathed in exquisite reflections. Finish each day with a gorgeous sunrise from the magnificent roof terrace. Designed for complete privacy and relaxation. This 8,000 Sq. Ft. Home can accommodate 12 adults and up to 6 children. With numerous areas for entertaining is the perfect spot for families and friends traveling together. Designed as a boutique vacation getaway you can enjoy the privacy and tranquility of your own home. Enjoy kayaking and snorkeling on the clear Caribbean sea, or just go on short ride to Xel-ha, one of the Riviera Maya's aqua parks or visit the Tulum Ruins. The swimming pool at Casa Buena Suerte is the largest pool on Bahia Soliman and is completely blanketed in handmade cobalt blue tile giving it a deep, rich color and silky smooth surface. The pool has a zero edge so the water rises right to the level of the deck giving the appearance of spilling into the Caribbean. There are several pool rafts so you can soak up the sun while relaxing in the pool or if you prefer, relax in a chaise lounge on the pool deck. Just across from the pool deck is our outdoor living room and kitchen; drinks and snacks are always nearby. The housekeeping staff is on duty Monday through Saturday to make your stay comfortable; luxury linens, Mayan spa amenities and a delicious continental breakfast to start the day. If you like, we can arrange a dinner service for you and your guests to be served in the villa, or we can make reservations at some of the best spots on the Riviera Maya; just let us know your needs and we will make every effort to assure they are fulfilled. For those who want to pamper themselves, our spa services include massage, yoga, manicure and many Mayan, holistic, and Ayurvedic treatments. Additional charges apply. Nearby, Tulum is a lively seaside town with restaurants, shopping and one of the most beautiful beaches in the world. Playa del Carmen is a bustling vacation city with lots of nightlife and several golf courses. We are also just minutes from Xel Ha, an ecological water park, and a short drive to Xcaret, an archaeological and water park where you can swim with dolphins. 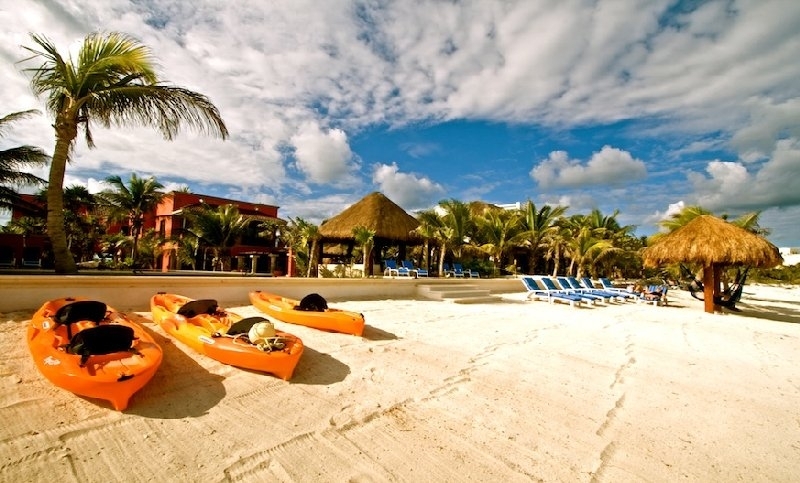 Soliman Bay is located on the Caribbean coast of Mexico otherwise known as the Riviera Maya. The Riviera Maya runs from Cancun at the north end to Tulum at the south end with Highway 307 as its lifeline. We are about 110 km from Cancun, or a 75 minute drive. Rental cars are readily available at Cancun airport, or a car service can be arranged. Complimentary welcome basket including beers, beverages, eggs, juices and all the staples. Complimentary breakfast from Mon-Sat - fresh squeezed orange juice, fruits, cereals, yogurts and pastries, fresh ground coffee and a special treat. Bose system surround sound stereo, CD, DVD player. Library with current books, CDs and DVDs. Locally mined marble flooring throughout the Hacienda. Spa amenities in each Bath including shampoo, conditioner and body wash.
Second floor kitchen and Guest lounge. Palapas with hammocks on the beach. Second Floor King bed, En-suite shower/ separate tub, Air conditioning, TV, Ceiling fan, Safe, Window screen, Private balcony overlooking the sea. Palapa suite 1 King, En-suite shower, additional Sofa Bed, air conditioning, safe, ceiling fan, patio with chaiselounges. Ocean view.